Usually the development or change of styles is considered as a process directed by persons: the artist, the patron, and sometimes intended audience or public. I will consider a radically different perspective on style formation, taking as a starting point the presence and agency of artefacts. Inspired by recent innovative concepts in archaeology, and psychology, I will focus on the decades around 1800, and will reconstruct how the new object scapes that came into being in Rome and Paris, as a result of the massive migration of objects caused by the political upheavals of the period 1789-1815, shaped the formation of Neo-Classicism. Equally inspired by recent psychological and anthropological theories of human-thing entanglement, I will look at explanations of style formation that go beyond traditional artistic or aesthetic considerations. The laboratory for this investigation will be Piranesi's Museo, the artefacts that were created there, and their biographies. Caroline van Eck studied art history at the Ecole du Louvre in Paris, and classics and philosophy at Leiden University. In 1994 she obtained her PhD in aesthetics at the University of Amsterdam. She has taught at the Universities of Amsterdam, Groningen and Leiden, where she was appointed Professor of Art and Architectural History in 2006. 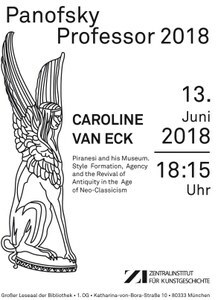 She has been a Visiting Fellow at the Warburg Institute and the Paul Mellon Centre for British Art at Yale University, and a Visiting Professor in Ghent, Yale and York. In September 2016 she took up her appointment as Professor of Art History at Cambridge, and in 2017 she gave the Slade Lectures in Oxford.